It’s been such an amazingly sunny and mild weekend that on Saturday, despite the zillions of things we had planned to do, we decided to take Lulu to the beach for a picnic improvised at the last minute. We wanted to catch the moment. Be in the moment. Right after breakfast, we packed sun lotion, a few blankets, hats and sunglasses–and food and drinks. 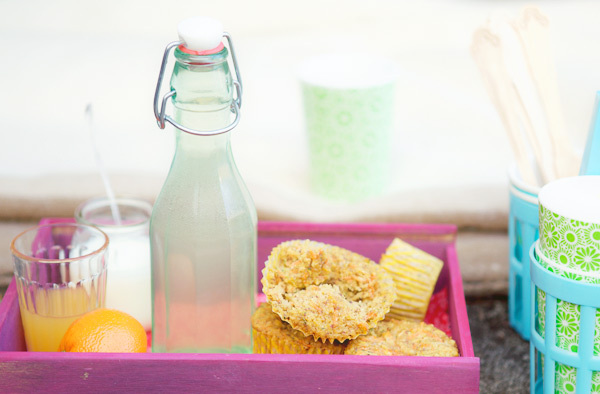 In our picnic basket, there were mandarins, yogurts, muffins and coconut and lime macaroons. The day was glorious. This time of year is special at the beach. It’s really one of my favorites. Because it’s lightly populated, with only the occasional families and couples, joggers, dogs and horses. And because the sun is still soft and gentle. It’s hard to describe the feeling with words, but seeing our little girl take still hesitant steps at the beach filled us with a tremendous joy. We showed her the ocean. She pointed at dogs running after a ball; she touched the sand, feeling the sea breeze and wind brush her delicate skin. She blabbered words that I like to imagine in French, and smiled whenever she was taking a few more steps. And when she looked tired and it was time for a snack, we sat down and enjoyed our fruit, yogurt and sweet treats. Lulu, more particularly, was pretty skilled at devouring her food. Rapidly. Asking for more. I make macaroons whenever I have egg whites left. Like my grandmother used to, when she was not making meringues instead. In her dining room, she kept a large metallic box with dark blue letters engraved on it. It was always filled with meringues and macaroons. For the visitors regularly stopping at their house. And her many grandchildren. Including me! These days, since I bake petits pots de crème every week–Lulu likes them as much as I used to at her age–I always have a lot of egg whites that need to find a home. So that’s when baking macaroons comes in handy. I like to add lime in mine, and enjoy them with tea, or yogurt and custard-based desserts. They are light and quick to prepare. “Addictive,” my mother-in-law once said during one of her visits. 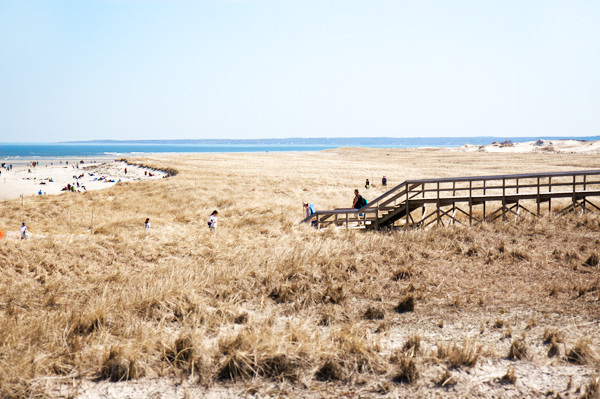 Like a picnic at the beach to celebrate the start of spring. That was such a lucky day! In a large bowl, combine all the ingredients and mix until homogeneous; set aside. Preheat the oven at 350 F. Cover a baking sheet with parchment paper. 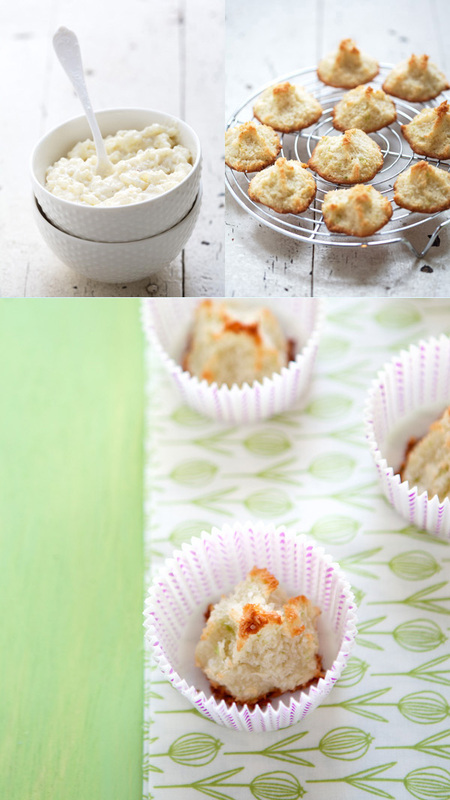 Place a small amount of coconut batter on the baking sheet and shape the macaroons with the tip of your fingers. Repeat until you run out of batter. Bake the macaroons for 12 to 15 minutes, or until the edges start to color. Remove and let cool completely on a rack. The macaroons keep for a week in an air-tight container. Dans une jatte, mélangez bien tous les ingrédients; mettez de côté. Préchauffez le four à 180 C et couvrez une plaque à pâtisserie avec du papier sulfurisé. Faites de petits tas de pâte sur la plaque et donnez forme aux macarons avec le bout de vos doigts. Répétez jusqu’à épuisement des ingrédients. Cuisez les macarons pendant 12 à 15 minutes, ou jusqu’à ce que les bords commencent à colorer. Faites complètement refroidir sur une grille. Les macarons se conservent pendant une semaine dans une boîte hermétique. How wonderful! We went to the beach yesterday too. It was beautiful and so is this post about your precious baby girl. La saveur du coco m’a également inspiré dernièrement… mais sous forme de pain. Such a beautiful post and you are wise to recognise that even when we are extremely busy, we have to take time out to enjoy our children and play. These look so wonderful. Really beautiful photos. (lulu is walking?!? how did that happen?) i love the gorgeous beach photos. Wonderful photos. Absolutely love your photos. Love the composition and color you have chosen. Your last photograph is specially very appealing. 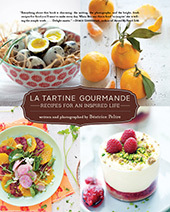 Natural light makes photos amazingly in true color and very real and mouth-watering. Love the props in the last photograph. Pieces of macarons on the table give an impression that someone just tried or ate some of them. Love the choice of color. Yellow gels with the yellow in the dish and having one color dominating in the photo makes it very focused and distraction free. These look gorgeous, can’t wait to try them. Thanks for sharing! Tout à fait ce qu’il me fallait pour utiliser “la tonne de noix de coco” que j’ai achetée sans vraiment réfléchir. 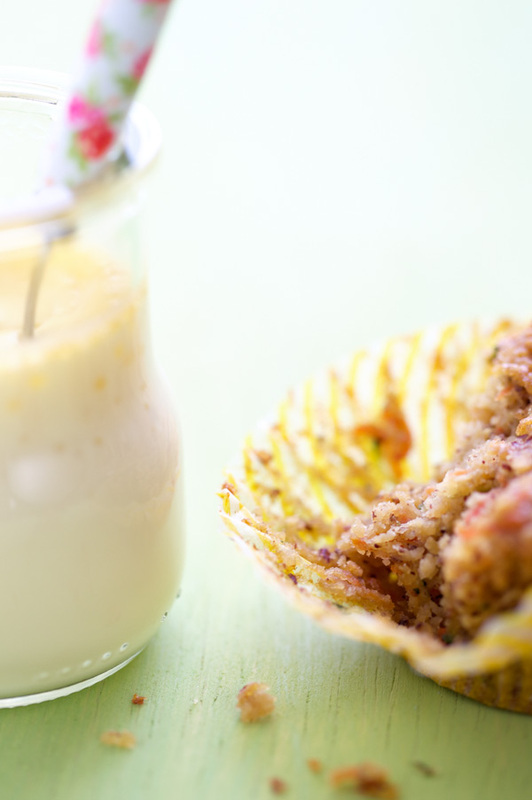 A great recipe I could use for office treats, as I have a new colleague who is allergic to gluten and dairy products. Thanks. I love your photos and your recipes. CE SONT FANTASTIQUES TES PHOTOS AVEC TON BEBE!!! Et la recette des macarrons superbe. On saturday afternoon I was having my cup pf tea with a friend, another foodblogger, and we were just talking about your enchanting photos and the joy and light they suggest. And we both agreed that such a brightness cannot come from any professional lamp, but from your heart! I love the simplicity of these macarons and your photos are always inspiring. Nice day at the beach!! Where do you get the yogurt in the jars? Is it something you have found in markets here in the states or do you make your own? If so, what brand yogurt maker do you use? I love,love,love macaroons. Thanks for the recipe! Lulu is so *cute* and you look good! oh Bea, i love macaroons so much but what i love about the post the most is to see lulu walking and having her hear the waves magical! beautiful pictures as well! I have been making macaroons a lot lately and my children love them. I use a different recipe with coconut flour… but I will have to try yours. It’s so simple. that’s true!! I also always make coconut macaroons when I have egg whites left (what is the case when I just baked “tresse au beurre” for example…). un bonjour de l’autre coté de l’océan! Macaroons are so DELISH! I must try this recipe. I really like to ask about your jars, remarkins, or i dont know what they called you baked looks very delicous petits pots de crème ? Both are glass ones, and ceramic ones? Please can you tell me ? The addition of lime is very appealing. Such beautiful and tempting imagery too. How lucky you are to have a beach nearby! Wonderful pictures as always! By the way, I am super excited since I just bought my ticket for the food blogger conference in London this June!! Can’t wait to hear your talks and to meet you in person! 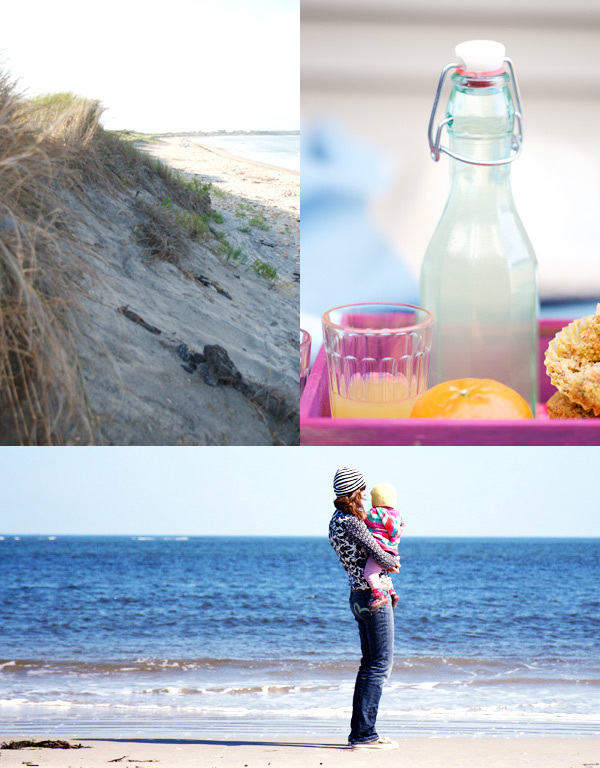 Somehow you managed to capture so many of my favorite things into one post: coconut, limes, picnics and the beach – and all with such gorgeous photos. Congratulations to your little one for getting her toes sandy! J’adore tous les desserts à la noix de coco. Ceux-ci doivent être particulièrement rafraîchissants avec le citron vert. It makes a change to see this kind of macaroon lately, I love coconut and lime together and I really like that green and white fabric you’ve used in one of the shots too. Can’t wait to hear your talk at FBC in June. 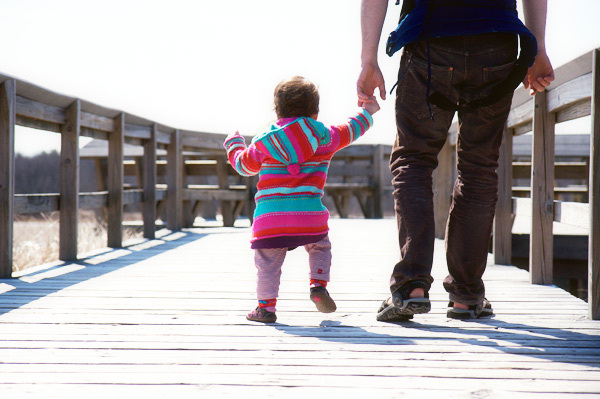 I keep looking at your photos, they are so beautiful!…The feeling of helping your precious daughter to take her first steps must be amazing! I will definately try your recipe. By the way, the muffins look great too, what are these? Thank you, merci, to everyone! Lulu’s first steps at the beach. I feel blessed to have picures to show her, one day! As to the jar glasses, they are indeed recycled jars from yogurts, brought back from France where it’s common to buy yogurts in such jars. Once, a long time ago, I also found two cute ones at Trader Joes, but I don’t think they make them anymore. Dimitra, the muffins are sweet but made with vegetables too. Lulu has no idea 😉 I will have to post the recipe. I must say, they are *really* delicious. i love a nice walk on the beach and then a picnic stop. i love seeing lulu’s first step. how wonderful and exciting it is when they start walking. Wow, the photos are gorgeous, it seems like it was a wonderful day! I love days when you have to bundle up but it’s sunny enough to be at the beach! And your macaroons look lovely. I’ve never added lime to macaroons before, but will be baking a ton of them over the next week for Passover, so I’ll hav eto give the lime a shot. Thanks! Two of my favorite flavors in one macaroon. Heavenly. Just like your photos! 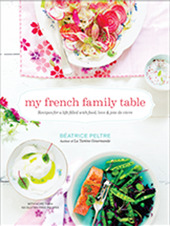 Not only I always love your stories, your recipes, your photo but also the soft and delicate mood you communicate. Your macarons look so simple and yummy! Ma grand-mère alsacienne faisait exactement la même chose avec des blancs d’œufs en trop: des macarons (plus souvent à l’amande qu’à la noix de coco) ou des meringues. Toutes tes photos (et les textes qui les accompagnent) dégagent énormément de choses… C’est très émouvant. Thanks again to everyone of you for your comments, and stopping by. Merci! i’ve been reading this website for a couple years now – the bright and colorful pictures are always a good break for the eyes! i made this recipe earlier this week and…it didn’t work! the batter was very liquidy and so the macaroons didn’t keep their form – instead, they kind of spread out like pancakes. for the second batch i tried adding a bit of flour and baking soda but that made them too floury. any tips? is the batter supposed to be so liquidy – and if so, how did you get the macaroons to keep their shape? Tigerswims, sorry to hear the macaroons didn’t work. They should certainly not spread at all. In fact, the batter is *not* liquidy at all. The coconut mixed to the whites should absorb the liquid. You have to mix until it’s fairly thick and you can shape the macaroons easily. What eggs did you use? If you were to find the batter liquidy again, add more coconut. I also like to work with the ti of my fingers to feel the texture of the batter. Hope this helps! And sorry that the first attempt was not right. Any chance that is Crane’s Beach?? I was there in January in similar weather and your photographs remind me so much of the ones I took then… but of course, beaches all look pretty similar. 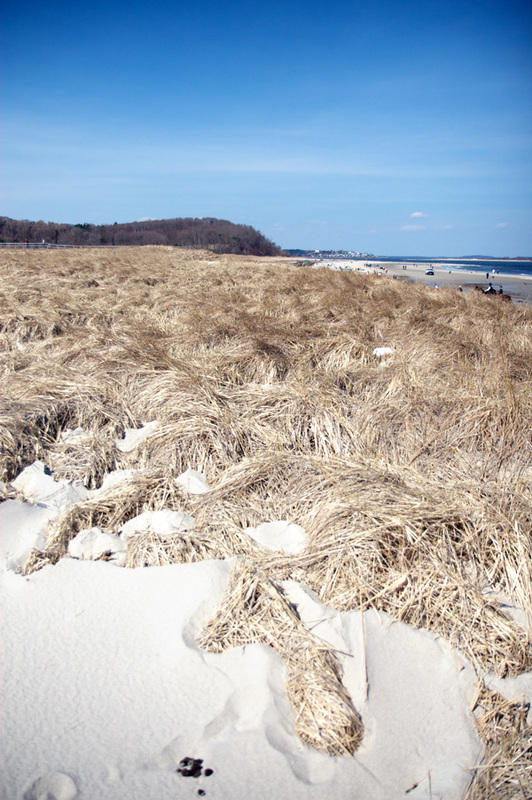 I love the wintery beach thing – the colors are just incredible. Un bien sympathique reportage (envoyé spécial la suite) qui a titillé mes papilles et dilaté mes pupilles ! I just made your recipe for macaroons. They came out delicious and were super easy (which is important for me, since I am such a novice in the kitchen.) Thank you for sharing! I just made these and they were delicious, easy and super quick – thanks a bunch! Question: do I need to beat up egg whites? Or it is ok to use them as they are? Egle, just use them as they are. 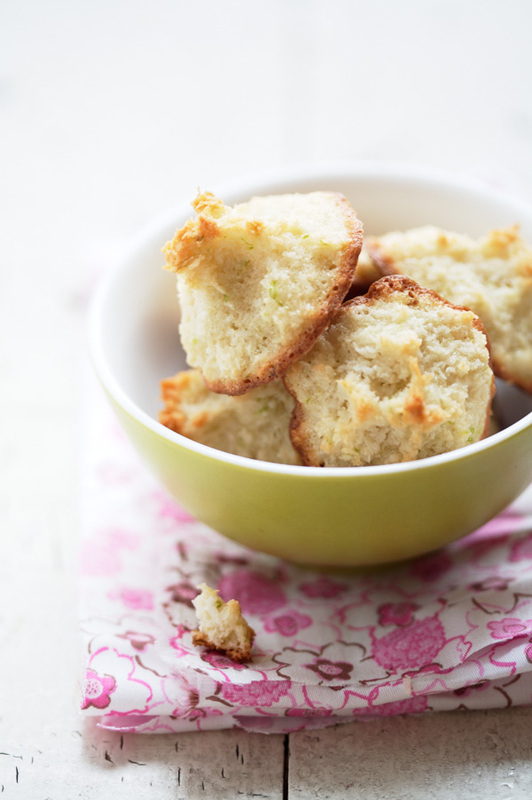 My very first batch of the lime macaroons came out of the oven only a few moments ago and they are mostly gone already..my husband just loves them! 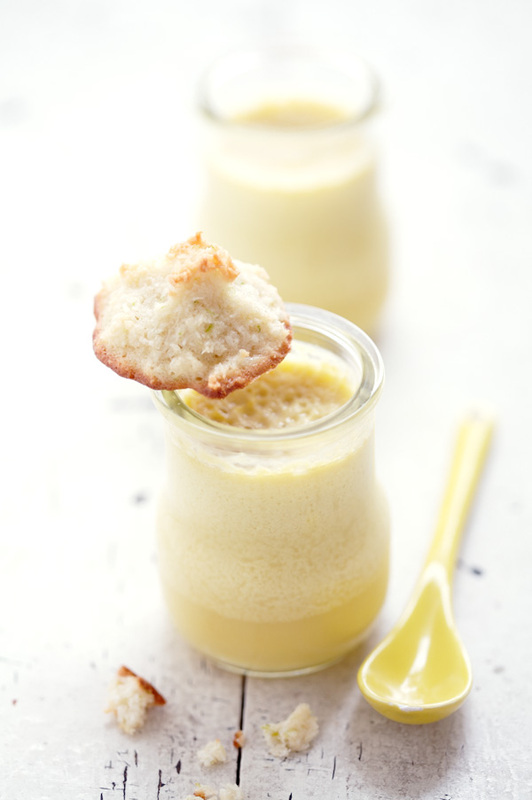 Thanks so much for the wonderful recipe and for producing such a beautiful blog! Yesterday I really felt like baking, so I made the macarons for our evening walk at the beach (I used lemon zest from our lemon tree instead of lime). 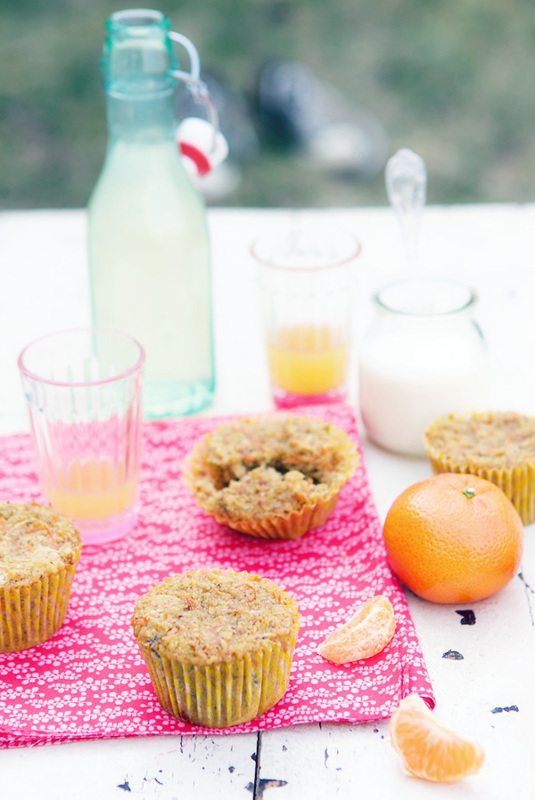 They were sooo delicious!…Béa, could you please post the recipe for the muffins too, when you have time? Oh your pictures are just beautiful. They should be in a magazine.. The one with the dad and baby walking on the dock just about melted my heart to the core. I think of my sister and her husband that just moved up north..I miss my niece so much! So beautiful. You are blessed!